Building a team of people making their dreams come true. Our mission is to create a team of people who are empowered and in action, fulfilling their dreams and making a real difference in the world. Our values are Passion, Accountability, Integrity, Contribution, Communication and Responsibility. The basic philosophy of Josselyne Herman & Associates is that our clients and staff are like a family, all out for each other's success and acting as a resource for each other in any area of expertise that they may possess. This unique method of working together towards making each others dreams come true, is what distinguishes us from other companies in the industry. One client's win is everybody's win. 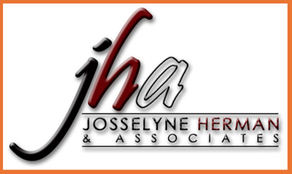 For more information about Josselyne Herman and Associates contact info@jhamanagement.com.